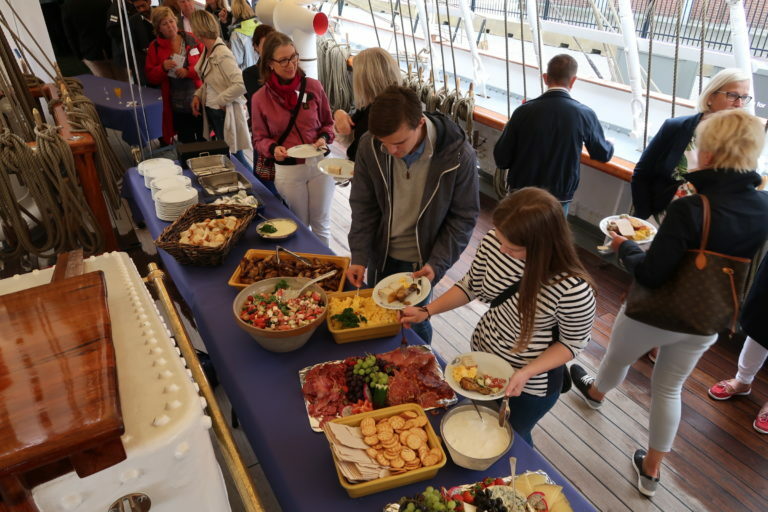 During The Tall Ships Races in Stavanger, several of the visiting ships will be offering deck events and day cruises while they are clustered along Vågen, in the heart of Stavanger. This is a great opportunity to make the most out of the festival, where the world’s largest and best-known sailing ships will be visiting again. You can hire a ship for an event to entertain both colleagues and business clients. At the same time, you are supporting the continued operation of the world’s most beautiful ships so that they can continue to sail with young people aboard on the seven seas. It will be a guaranteed success and an unforgettable experience. Wedding parties – also wedding ceremonies! Other requests or creative ideas? To hire a sailing ship, please enter your requirements on our registration form and we will contact you for further details. All agreements are made with the individual ship and therefore all revenue goes directly to the ship. Some ships offer their own catering and other dining arrangements, while others ask that this is brought on board. We can offer menus from our catering suppliers Fisketorget, Deja Vu or Matmagasinet. Be quick – it’s on a ‘first-come, first-served’ basis!